Showers in the D.C. area Friday afternoon and evening will make way for a beautiful weekend. In the early afternoon temperatures in the region ranged from 47 degrees in Hagerstown, Maryland to 71 degrees in Staunton, Virginia. 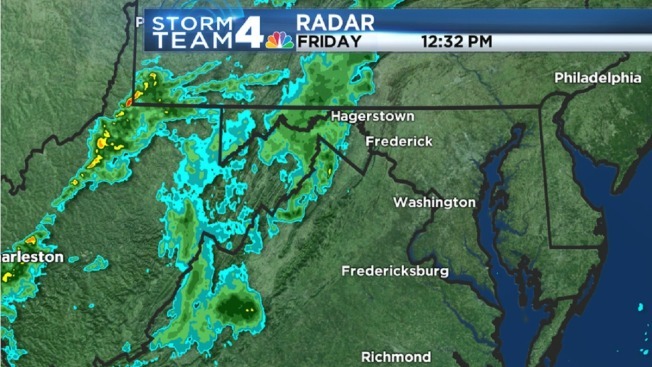 Rain will weaken Friday afternoon as it moves from along I-81 in Virginia east toward the D.C. area. The threat of severe weather has diminished; any storms would most likely occur well south of Washington, near Staunton, Fredericksburg and southern Maryland. However, isolated and damaging winds are the main concerns as the weather pattern moves across the region. In Baltimore, some rain is likely ahead of the Orioles home opener against the Blue Jays Friday but the game will likely get in. The first pitch is scheduled for 3:05 p.m. The threat of rain will end by 8 or 9 p.m. Friday, making way for a clear weekend. Temperatures will reach near 70 degrees both Saturday and Sunday. Take advantage of the nice weather and head down to the Tidal Basin to see the cherry blossoms. The National Park Service predicts peak bloom Saturday through Tuesday. It's the last weekend of the National Cherry Blossom Festival in D.C., which is going out with a 10-block parade starting at 10 a.m. Saturday. The parade runs along Constitution Avenue between Seventh and 17th streets, NW. Tickets for grandstand seating start at $20 or stand between Ninth and 15th streets for free viewing. Stay with News4 on-air and online for frequent updates on this evolving forecast.